Golf Cart Series: All Aboard the B-Town Shuttle - It's FREE! Golf Cart Series Part 4: All Aboard the B-Town Shuttle – It’s FREE! One local company is providing a wonderful FREE shuttle service in downtown Bradenton, Village of the Arts, Tarpon Point, Riverwalk and all the way to McKechnie Field. The service not only helps people get around town, it also gives people the chance to experience the fun and convenience of riding in a Low Speed Vehicle. 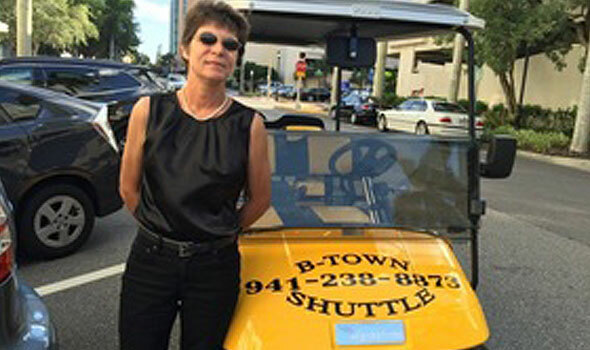 It’s called the B-Town Shuttle Service and it’s hard to miss with its bright yellow custom built six-passenger Low Speed Vehicles traveling around the Bradenton entertainment district. So, after 35 years of working in computers and bookkeeping, she bought a Low Speed Vehicle with her own money and began providing complimentary pick-ups and drop-offs. In addition, the company has an active Facebook page that lets locals know all about what is happening in the area. Local business operators, including Mike Gold of the B’Towne Coffee Company on Old Main Street, not only love it but are helping to keep going by supporting it through advertising. That support is what is keeping the service free to riders, although tips are certainly welcome. O’Keefe says the B-Town Shuttle Service is looking forward to serving the citizens of Manatee County for many years to come and expanding its services to meet the needs of the community. For information, call 941-238-8873 or email btownshuttle@gmail.com. As a final note, the B-Town Shuttle Service assures its riders that it is licensed and insured. We’ll be exploring those subjects in upcoming posts. The entire firm of Heintz & Becker offers its enthusiastic appreciation to Kimberly O’Keefe and the B-Town Shuttle Service and we encourage everyone to get on board and support this valuable service. This entry was posted in Golf Cart Accidents. Bookmark the permalink.